Finished Satyr from the Shadows and wondering what’s next? The following schedule of books is tentative and titles may be added or rearranged based on time and the Muses. Clicking their links will take you to their Goodreads pages if you want to add it to your TBR shelf to keep up with it; also, you can join my mailing list to keep up to date with the latest releases and any other news. 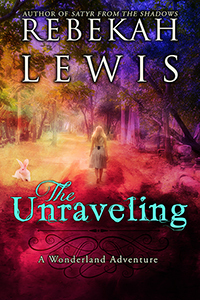 The Unraveling (Wonderland #2) -Hatter and Melody’s story/Continuation of of Cadence and Gareth’s story. Note: the print edition will contain both The Vanishing and The Unraveling. The Satyr Prince (The Cursed Satyroi #4) – Vander’s story!